This shirt is from Go Ape Shirts. Cori is a tremendous fFan of The Wizard of Oz. It’s got music, adventure, danger, excitement, puppies, monkeys, sparkly shoes, a lion, a robot, and a zombie! What’s not to love!! We have actually seen a slight increase in zombie-related scarecrow shirts. It’s possible you might see more of them, here, soon. 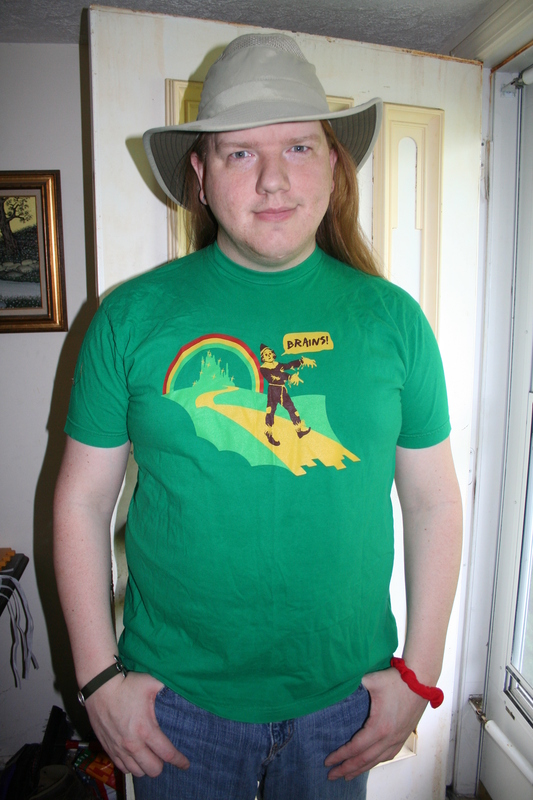 We’re pretty sure Go Ape Shirts had the concept before a lot of places seemed to pick up on it, so good fFor them. You should really read some of Baum’s work, by the way. I don’t think he’d mind the imagery of the Scarecrow as a zombie. “I don’t care,” replied Kiki Aru, scowling. “Aren’t you afraid to be wicked?” asked the sparrow.